For those of you who have been around the blog for a while you will know that we LOVE our Mass Box subscription. The kids so look forward to the videos, crafts, and now the bonus Superbook DVDs. Recently, the Mass Box has teamed with the Christian Broadcasting Network and every monthly box includes a Superbook DVD. Anyone remember Superbook from growing up? They’ve updated the animation and characters but still encourage your kids to dive into the Bible stories. I’ve been toying with the idea of branching out into the world of affiliate programs, but don’t want to get caught up in it. Do you know what I mean? So, starting slowly, I’m so pleased to share that I am officially a promoter and affiliate for the Mass Box. We were one of the first families to try out this subscription box. Back in Lent 2016 Ashley and Raymond (founders of the Mass Box) sought out 100 families to do a trial run and give feedback for their idea. The response was overwhelmingly positive from us and from others, as you may have guessed since they are still going strong! We have loved growing with the Mass Box family. I have seen how attentive they are to the needs of families as they continue to ask for feedback, solicit reviews and ideas and engage in encouraging and supportive conversations with their subscribers. 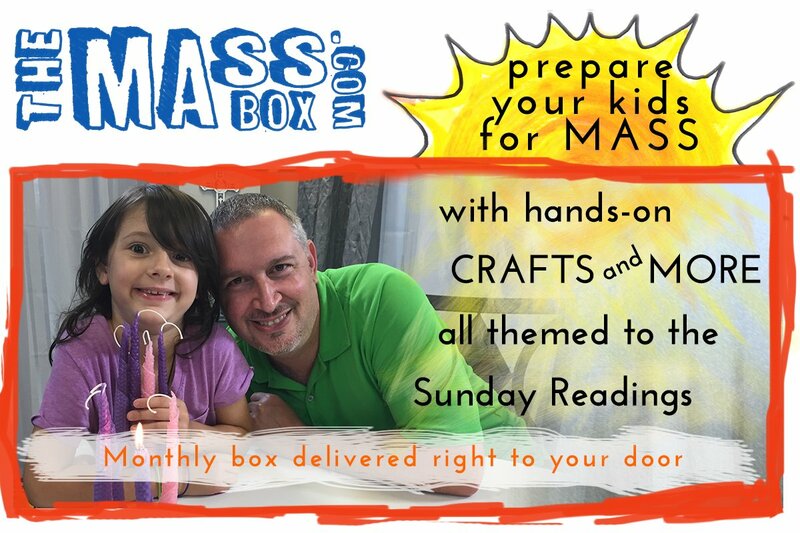 The Mass Box is, for those who don’t know or need a refresher, is a monthly subscription box that helps prepare the whole family for Sunday Mass. The crafts are best for, in my opinion, ages 4 – 8 or 9, but they can definitely be done younger (with help) or older for craft loving kids. Each week there is a short Youtube video where Ashley and Raymond’s children do the weekly craft, explain the readings and how everything is connected. These videos are completely free for anyone – check them out! In the box comes everything you need to complete the crafts for the month. They also include a weekly magazine that has the directions for the craft, the readings and some activities that relate to the readings (word searches, colorings, Q&A, games, etc.). These magazines are perfect to bring to Mass for busy hands that need something to focus on. And on top of all that, as I mentioned earlier, now they are also including a new Superbook DVD each month. Every single Sunday has a craft, magazine and video. Plus, because these people are totally legit and this is what sold me on the whole thing in the first place – they also include crafts, videos and magazines for all the Holy Days of Obligation as well!! You can also opt to skip a month or two if you know you are going to be on vacation or for some other reason know you will be missing the opportunity to do the crafts for a period of time. The makers of the Mass Box have done a really nice job trying to offer a wide variety of options to fit families of all sizes. You can subscribe for the box with craft supplies for 1-4 children. You can also get a box for just a single month to try it out. There is also something called the Mass Box Lite which includes the craft materials for one Sunday, but the magazines for all the Sundays and Holy Days. You can also order just the magazines if the craft element isn’t totally up your alley. You can also opt to skip a month or two if you know you are going to be on vacation or for some other reason know you will be missing the opportunity to do the crafts for a period of time. If this sounds like something your family needs, or you know a family that would benefit from this kind of preparation for Mass, please click on any of the links here. You will go straight to the Mass Box website and sign up. Click “Subscribe” at the top of the Mass Box homepage for the subscriptions, or click “One Time Shop” for the single order boxes. As an affiliate, I will receive a 10% kickback on any order you make (subscription or one time) when you use the links here. If you need more evidence of the enthusiasm for the Mass Box, check out this video my kids took while unboxing the August Box. This month, our favorite craft was using our Mass Box boxes to make sandals. Jesus sent the disciples out in pairs, directing them to take along for the journey nothing but sandals and a walking stick. Our walking sticks have since turned into fairy wands, but the sandals are still intact and used for spreading the Good News. As I keep working on my Philippians 2 book, I’m beginning to hope for some more opportunities for this blog. But as all things, finances are part of the equation. My husband and I both appreciate this small way you can support these writing dreams of mine.